This blog entry is off topic from my usual app dev related publications. Several years ago I worked on an IBM project “Reinventing EMail”. At that time we came up with many ideas how to improve the mail experience. One of the ideas was how to improve the search functionality. Mike O’Brien, Greg Klouda and I wrote a patent SEARCH BAR WITH INTELLIGENT PARAMETRIC SEARCH STATEMENT GENERATION. Below is some context why we wrote this patent. After years of trying to organize mails in folders, at some point I gave up. Now I only have one folder called “old mails” where I move everything into that I don’t want to delete but don’t have to work on anymore. I think “folders are dead” or at least shouldn’t be used anymore. I experienced that folders don’t help me. After I moved mails in folders I often forgot in which folders I moved specific mails anyway. The internet doesn’t have folders either. Information is found via search. Search results for mails can easily be improved by appreciating the nature of mails. When you search for something in the internet, often you look for information you’ve never seen before. For mails that’s different since you often remember some additional metadata, e.g. who else was in the mail thread, when roughly did you read the mail (yesterday, last week, last month), sometimes you remember whether the mail had an attachment, link, etc. Searching for mails is in most cases information retrieval rather than searching for potentially non existing information. Most email clients today have “parametric search” functionality. In the patent however we tried this experience to be more like the experience for internet searches. As my professor at university always kept saying “Don’t use dialogs. Reduce the steps of enforced sequences”. The patent contains some screenshots. The core ideas are still valid, but today I’d do it a little differently. Below is a rough mockup. 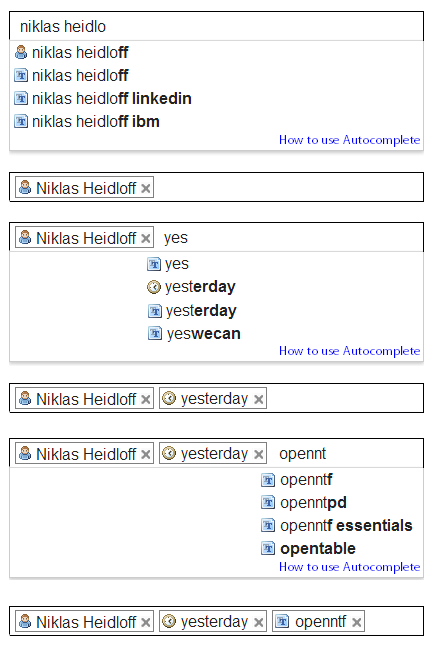 It shows how to find a mail from Niklas Heidloff from yesterday with the word openntf in it. I know the debate about the need for mail folders is almost a philosophical debate. If people are happy with their folders I’m the last person trying to convince them to change their behaviors.